My favorite seasons are Fall and Winter. In my hometown, it got so hot that we didn’t have much of a winter. I always was in love with the thought of winter, the scenery, and bundling up. I absolutely love the saying ‘We are like a snowflake, all different in our own beautiful way’. I finally moved more North to be able to enjoy the chilly season. When I finally got to experience my first snow, I fell in love. Everything looked so different when covered in snow and it is truly is incredible. Speaking of love, one of my favorite craft projects is house ware items. I love making items that will be used daily or weekly. I wanted to combine my love of snowflakes and housewares so I created The Let It Snow Basket. In this blog post, you will find my smaller basket and the charts included to help you make this one of a kind piece. In the premium version of the pattern (see Pattern Downloads), you will find my larger basket that is large enough to help you organize clothes, big projects, blankets, and other large pieces. I hope you can enjoy this homemade home ware project as much as I did designing it. 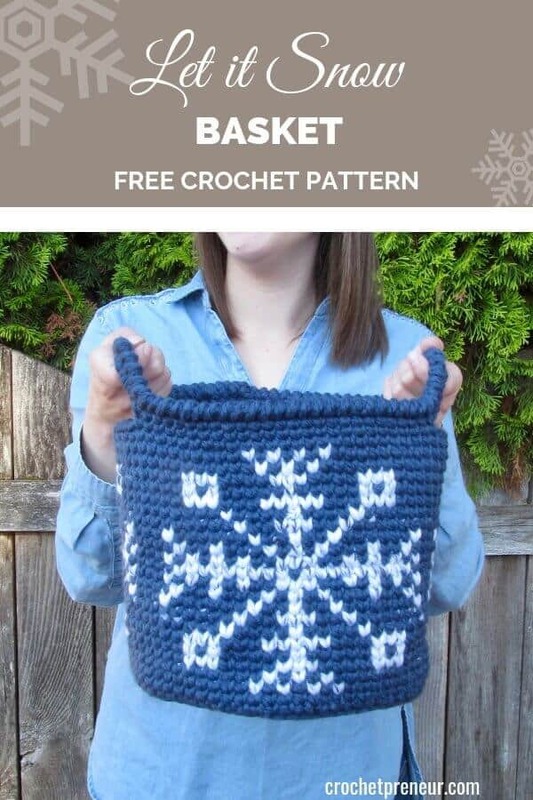 Purchase the premium pattern which includes instructions for the Let it Snow Basket in two sizes! The medium size pattern is found, below and the large size is part of the premium pattern. Find it on Ravelry. Measurement(s): Medium Size: 9.5-inch-tall, 10-inch-tall with handles, and 10 inches wide. CH 1 does not count like a stitch. This basket is worked in the round from the bottom up creating the base first, the sides, then the handles. We will not be chaining at the start of any row unless noted. This will give a clean start of each row for a seam-free look. When creating the snowflake, we will be using the waistcoat stitch to help make sure our snowflake is stacking on top of each instead of slanting to the side. It also makes this basket very sturdy. Make sure you are watching your yarn during color changes to not get tangled or twisted. Move up the stitch marker as you go to keep track of the beginning of each row. We will now begin the sides of the medium basket. You will now follow the charts for Rows 2-25 using the WC ST. The 1st chart is of all 3 snowflakes on the basket and the 2nd chart is of a close up of the snowflake. Note that we will be working in the round, so each row will start on the right side of the chart. Before starting Row 2 start carrying the CC to help the basket be consistent and move up the stitch marker each row and continue to carry the CC on Row 24-25. We will not stop carrying the CC. I know you’re going to love making the Let It Snow Basket and I so look forward to seeing your finished product. Sarah LarRieu is the designer and maker behind Nohooksgiven. She is based in Eugene, Oregon. She has been crocheting since she was a teen and fell deeply in love with the craft, later prompting her to learn to knit, as well. Her inspiration to share her love of creating comes from having been taught to crochet by her mother, who passed away when Sarah was 18. Her mother’s kindness and love has also inspired her to help others feel confident behind themselves, which she hopes to achieve through her blog and social media outlets. When not designing, her favorite things to do are to cuddle with her pets and enjoy time with her husband, family, and friends.